Over time, brake fluid can become contaminated as moisture builds up. Most brake components contain copper and when copper is exposed to moisture, it begins to erode. As brake components erode, particles can begin to contaminate the brake fluid – and that means it’s time for a brake fluid change. During your free brake check, a Tire and Auto Service Professional will inspect and perform a strip dip brake fluid test to determine if you need a brake fluid change. 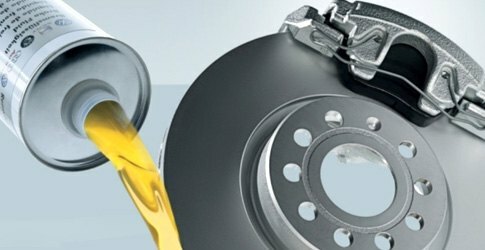 If the strip dip brake fluid tests reveals that your brake fluid is contaminated then it’s time for a brake fluid change. The need for brake bleeding arises when air gets into your brake fluid line. The introduction of air into the brake fluid can be caused by a leak, overrunning of the master cylinder, or simply from having had recent work done on your brakes. If air has made its way into your brake fluid line, it causes your brake pedal to have a soft, spongy feeling when you press down on it. If you are experiencing this when braking, you may need brake bleeding to correct the problem.